Posted in economics, game theory. Many arguments are called ‘cynical,’ but is there anything that is common to them? Is there a general form of cynical argument? One type of cynical argument is a kind of reductio ad absurdem, a proof by contradiction, to discredit a premise. The first step is to take the premise and associate it with some worldview. Then, the cynic discredits those worldviews. What is unique here is the use of worldviews. The cynic generalizes from the premise to associated worldviews. Instead of finding something wrong with the premise itself, the cynic objects to any line of thought that leads to the premise. Therefore, the criticism mounted here is existential: The cynic objects to people’s way of life, their existences. In doing so, the cynic changes the standards of evaluation. Though the premise may be unassailable on its own, when it is placed in the wider context of life, it no longer remains innocent or safe. By focusing the argument in this way, the premise can be seen as a symptom of affliction, an unwanted life—an absurdity. I find this argumentation style particularly interesting because of the Cynical Generalization step. The generalization is something like modal. However, it is not a generalization to possible worlds, but to possible lives. The cynic considers all possible lives that include affirming the premise and asks whether it is possible or desirable to live those lives. Since we do reject different ways of life all the time that we feel are not for our selves, this argument style cannot be dismissed as flippant. Moreover, it is an extremely powerful argument: as historical cynics have shown, if you are willing to forgo the trappings of society, you are freer to reject its laws and conclusions. Let me postulate, for this discussion, that doing philosophy and publishing are very different enterprises. That is, the content of the philosophy is separate from the distribution of it, and while you hope that your philosophy has some merit, we are currently concerned with getting it published regardless. Consider the top philosophy journals, not as philosophy journals, but just as publications. Do these journals compete with each other? Yes, but they also cooperate more. If anything, the top journals are in coopetition. While the journals do compete for the best new content, consider how they make their money. They make their money by being purchased, in this case by academic libraries with limited resources. They will only get purchased if the libraries (and philosophy departments) feel that there is active research going on that they need to access. So it is much more important for journals to have an active discussion amongst themselves to give the appearance of active research being done (again regardless of merit). It is not so much that they compete with each other, than they are in competition with everyone outside their area. Now, how do these journals show that they have an active discussion? They reference each other, back and forth. This mutual referencing fosters the importance of the discussion, and hence the journals too. Once the discussion has begun, all other journals that wish to publish on the topic will have to reference back to the original journals, again fostering the original journal’s importance. Hence a journal, or group thereof, that fosters a discussion—a niche if you will—will effectively block out other journals. All other or new journals will always be playing catch-up since they will inherently have fewer references and hence be less important. This suggests that citations and referencing is a highly strategic business practice. Journals need to get themselves into the discussion somehow to make themselves relevant. If possible, they want to be the nexus of the discussion. One interesting consequence is that it is less the individual researchers or papers that are cited, but that the journal is cited at all. The journal wants to be in on the discussion, and it doesn’t matter how it gets there. This suggests a bias towards references that include the journal or involve the journal in discussions, whether those references are relevant or not. This leads to the treatment of ‘stars’ within the profession. If the journals publish the writing of a ‘star’ they will immediately get themselves into a position where people need to have that person’s work. So it is a good strategy for a journal to play into ‘star’ writers and to burnish their reputation (e.g. dedicated journal issues, invited papers) since this will make their research seem important and require people who do research to reference the work of the star in that journal. Consider, then, why we cite. Is it to give credit to those who did great work? Sure, but there is too much at stake in terms of reputation (reputation yields job offers and money) for that to be the sole reason. Is it to show we know what we are talking about? Unlikely but possible: journal publishing is not done to show that you have the done the reading, and if you are talking about something important then it doesn’t matter who is referenced. Is it to make our lives easier, so we don’t have to argue every point? Likely at times, this is again too simplistic in terms of other issues. Is it because it plays into the business model of the journals? Probably more than we want to admit. As mentioned above, journals will be biased towards self referencing their publication. Hence, if your work can be framed in a way that allows for journal self references, all the better. Same goes for citing stars. This also means that the bias could allow for references to go unchallenged: e.g. reference Hume for everything (or David Lewis), and always have some references to big journals. Conversely, less prominent work can be slipped in unnoticed if it is sandwiched between stars and big journals. Perhaps there is an optimal ratio of prominent authors and different top journal references to less prominent references to give the appearance of new-ness and importance to the discussion. At any rate, journal publishing exists at the intersection of business and philosophy, and it does no good to treat the double blind review as the only factor in getting published. Posted in game theory, news, philosophy. What is a scientific theory? In an abstract sense, a scientific theory is a group of statements about the world. For instance the Special Theory of Relativity has, “The speed of light in a vacuum is invariant,” as a core statement, among others, about the world. This statement is scientific because, in part, it is meant to hold in a ‘law-like’ fashion: it holds across time, space and observer. The Popperian view is that we have scientific theories and we test those theories with experiments. This means that given a scientific theory, a set of scientific statements about phenomena, we can deductively generate predictions. These predictions are further statements about the world. If our experiments yield results that run counter to what the theory predicts — the experiments generate statements that contradict the predictions, the theory did not hold across time, space or observer — then the theory eventually becomes falsified. Else the theory may be considered ‘true’ (or at least not falsified) and it lives to fight another day. The game theoretic semantics (GTS) view is that truth is the existence of a winning strategy in a game. In terms of the philosophy of science, this means that our theories are strategic games (of imperfect information) played between ourselves and Nature. Each statement of a theory is a description of a certain way the world is, or could be. An experiment is a certain set of moves — a strategy for setting up the world in a certain way — that yields predicted situations according to the statements of the theory. If our theory is true and an experiment is run, then this means that there is no way for Nature to do anything other than yield the predicted situation. Said slightly differently: truth of a scientific theory is knowing a guaranteed strategy for obtaining a predicted Natural outcome by performing experiments. If the strategy is executed and the predicted situations do not obtain, then this means that Nature has found a way around our theory, our strategy. Hence there is no guaranteed strategy for obtaining those predictions and the theory is not true. Take Galileo’s famous experiment of dropping masses off the Tower of Pisa. Galileo’s theory was that objects of different mass fall at equal rates, opposing the older Aristotelian view that objects of greater mass fall faster. According to the Popperian view Galileo inferred from his theory that if he dropped the two balls of different mass off the tower at the same time, they would hit the ground at the same time. When he executed the experiment, the balls did hit the ground at the same time, falsifying the Aristotelian theory and lending support to his theory. The GTS view is that dropping balls of unequal mass off a tower is a strategic game setup. This experimental game setup is an instance of a strategy to force Nature to act in a certain way, namely to have the masses hit at the same time or not. According to Galilean theory, when we are playing this game with Nature, Nature has no choice other than to force the two masses to hit the ground at the same time. According to Aristotelian theory, when playing this game, Nature will force the more massive ball to hit the ground first. History has shown that every time this game is played, the two masses hit the ground at the same time. This means that there is a strategy to force Nature to act in the same way every time, that there is a ‘winning strategy’ for obtaining this outcome in this game with Nature. Hence the Galilean theory is true: it got a win over the Aristotelian theory. GTS handles scientific practice in a relatively straightforward way. Theories compete against Nature for results and against each other for explanatory power. Everything is handled by the same underlying logic-game structure. GTS is a powerful system. It has application to game theory, computer science, decision theory, communication and more. If you are sympathetic to a Wittgensteinian language game view of the world, GTS is in the language game tradition. Posted in game theory, logic, philosophy, science. 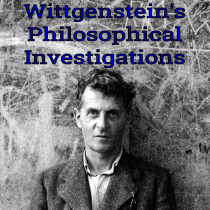 Tagged with game theory, logic, philosophy, science, wittgenstein. You think this has nothing to do with you. March 29, 2013 by nogre · Comments Off on You think this has nothing to do with you. Philosophy is disparaged often enough, and by people who ought to know better. As of late, every time this happens I think of this scene — but with the text (something like) below…..
You go to your desk and you select, I don’t know, some statistical mathematical model, for instance, because you’re trying to show the world that you take science seriously and follow what you think are established scientific practices. But what you don’t know is that that mathematical model is not just established science. It’s not a data model. It’s not a model of phenomena. It’s actually a deductive nomological model. And you’re also blithely unaware of the fact that in 1277, the Bishop of Paris proclaimed that a multiplicity of worlds could exist. And then I think it was Pascal, wasn’t it, who argued that probabilistic mathematics could be applied to situations? And then mathematical models quickly showed up in many different philosophies. And then it, uh, filtered down through to natural philosophy and then trickled on down into some basic handbook of science, where you, no doubt, adopted it without another thought. However, that statistical model represents millions of hours and countless lives. And it’s sort of comical how you think that you’ve made a choice that exempts you from philosophy, when, in fact, you’re using ideas that were selected for you by the people in this room. Posted in philosophy, random idiocy, science. This is an application of the theory of kakonomics, that is, the study of the rational preferences for lower-quality or mediocre outcomes, to the apparently weird results of Italian elections. The apparent irrationality of 30% of the electorate who decided to vote for Berlusconi again is explained as a perfectly rational strategy of maintaining a system of mediocre exchanges in which politicians don’t do what they have promised to do and citizens don’t pay the taxes and everybody is satisfied by the exchange. A mediocre government makes easier for mediocre citizens to do less than what they should do without feeling any breach of trust. She argues that if you elect a crappy politician, then there is little chance of progress, which seems like a bad thing. People do this, though, because maintaining low political standards allows people to have low civic standards: if the politicians are corrupt, there is no reason to pay taxes. Likewise, the politicians who have been elected on the basis of being bad leaders have no incentive to go after tax cheats, the people who put them in office. Hence there is often a self-serving and self-maintaining aspect to making less than optimal decisions: by mutually selecting for low expectations, then everyone cooperates in forgiving bad behavior. This account assumes that bad behavior of some sort is to be expected. If someone all of a sudden starts doing the ‘right thing’ it will be a breach of trust and violating the social norm. There would be a disincentive to repeat such a transaction again, because it challenges the stability of the assumed low quality interaction and implied forgiveness associated with it. I like Origgi’s account of kakonomics, but I think there is something missing. The claim that localized ‘good interactions’ could threaten the status quo of bad behavior seems excessive. Criticizing someone who makes everyone else look bad does happen, but this only goes to show that the ‘right’ way of doing things is highly successful. It is the exception that proves the rule: only the people in power — those that can afford to misbehave — really benefit from maintaining the low status quo. Hence the public in general should not be as accepting of a low status quo as a social norm, though I am sure some do for exactly the reasons she stated. This got me thinking that maybe there was another force at work here that would support a low status quo. When changing from one regime to another, it is not a simple switch from one set of outcomes to the other. There can be transitional instability, especially when dealing with governments, politics, economics, military, etc. If the transition between regimes is highly unstable (more so if things weren’t that stable to begin with) then there would be a disincentive to change: people won’t want to lose what they have, even if it is not optimal. Therefore risk associated with change can cause hyperbolic discounting of future returns, and make people prefer the status quo. Adding high risk with the benefits of low standards could make a formidable combination. If there is a robust black market that pervades most of the society and an almost certain civil unrest given political change (throw in a heavy-handed police force, just for good measure), this could be strong incentive to not challenge an incumbent government. Posted in economics, game theory, mind, philosophy. Tagged with economics, game theory, mind, philosophy. Though Matthen was referring to doubts about Darwinism being sufficient to lead to consciousness, there is another way to understand this intelligibility argument. If we grant that consciousness is something very special, though not unphysical, someone might consider the laws of physics to be constructed, teleologically, to permit consciousness. This is to say that our physics is teleogically directed to account for consciousness. The claim is not that consciousness was necessitated by our physics, but that our physics must conform to allow the possibility of consciousness. What is one philosopher’s Nature is another’s Teleology. Now, I can’t see any philosophical motivation for this outside of a very deep belief that consciousness is exceptionally special. But if we grant exceptional status to consciousness, then it wouldn’t be ridiculous to consider that our physics must somehow be subject to the requirements of consciousness instead of the other way around. Whereas there may be infinite other possible physics that do not allow for the possibility of consciousness, we live under a physics that does. My immediate, knee jerk response to this sort of move is that it is just a semantic shift about the meanings of teleology and nature, nothing deeper. If what the teleologist means by teleology is what others mean by nature, then there is no difference of opinion, only word use. However, this semantic response does not engage the motivation for the teleological argument. The motivation is that consciousness is exceptional. So, if the naturalist believes that consciousness is exceptional and entirely natural, then the naturalist is left with no natural explanation for why it is so exceptional. However the teleologist may say that consciousness is exceptional, subject to the laws of physics, but unsurprising, since the laws of physics itself are directed to allow for consciousness. Since the teleological account does a better job at explaining something as special as consciousness, it is preferable. This conclusion about preferring the teleological explanation to the naturalistic one is based on the absolute assumption that consciousness is exceptional. But how exceptional must it be? Since we are making physics, and presumably the rest of science, subject to our assumption, then the reasons for our assumptions must then be ontologically more basic and more certain than our entire scientific understanding of the world. Personally I do not have any basis for thinking consciousness is so special that all of science must be made to account for it. From my perspective, claiming that science must conform to consciousness is a post hoc ergo propter hoc fallacy, since I’d have to arbitrarily assume consciousness to be a fundamental substance and science to be constructed to allow for it. However, there could be people who do have beliefs that strong. For them, they would not be arbitrarily assuming consciousness to be the more fundamental substance in the universe and hence it would follow that science should conform to it. Instead it would be a direct causal link: consciousness, therefore science that teleologically allows for consciousness. This kind of teleological naturalism is special in that it does not appeal to the unlikelihood or complexity of consciousness evolving, as is wont to happen nowadays, but is based on an ontological claim about consciousness. I don’t know if this is more defensible than the Intelligibility Argument based on likelihood, but, as it is different, perhaps it has a chance to fair better. Posted in biology, design, evolution, ontology, philosophy, physics, science. Tagged with biology, ontology, philosophy, science. What comprises an ethical decision according to theory? For the Consequentialist the crux is always in determining and executing the best consequences. * This means that making a consequentialist decision involves two steps. First is to imagine different possible futures and evaluate them. Once the evaluation is done, the consequentialist chooses the future scenario that maximizes the ‘Good’ (or what have you) and works towards realizing that scenario. Being moral is having skill in figuring out the best future and achieving that future. The task in Deontology is to obey rules and imperatives. To follow a rule is to understand the rule, when it applies, and how you should act to be in accordance with it. Being moral is understanding imperatives and comporting yourself to act according to them. In Virtue Ethics the goal is to be virtuous. We become virtuous by habit: by habituating ourselves in certain ways we change ourselves into the person we wish to become. Being moral is having undertaken the work to become the person we wished to be. Once we are the virtuous person we wish to be, whatever we decide to do is the moral thing. From this short sketch we can set up some interesting oppositions. The first thing to notice is that both Deontology and Virtue Ethics are concerned with how an agent has changed themself in order to act morally. A virtuous person has habituated themself according to their idea of excellence and a deontologist has comported themself to act according to the rules. Though the target of the change is different, the act of self-change is common to both theories. A consequentialist, however, is less concerned with changing themself and more interested in how they can effectively change the world. It doesn’t really matter to the consequentialist how the best scenario is achieved, so self-improvement is less important than world-change. 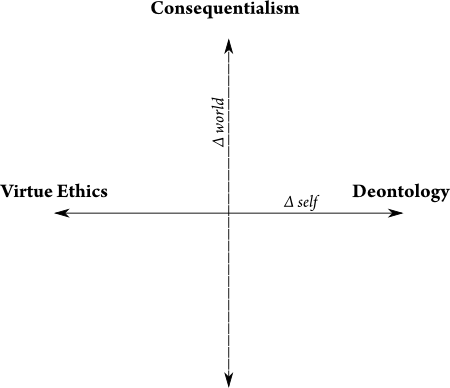 Consequentialism and deontology have something in common that virtue ethics does not. The two modern ethical systems both have an abstract standard for deciding what is moral. Consequentialists have a calculation of the good and deontologists have rule systems to obey. Both calculating the good and following a rule system can be thought of as an objective, independently evaluable procedure. Living the life you want to lead according to your virtues, does not require following an independent abstract procedure. It is, instead, based upon an understanding of human life. Charity Ethics is based upon increasing our empathy for others. To increase our empathy we have to act charitably towards each other; only by acting charitably do we have the opportunity to find common ground. So the fundamental decision of charity ethics is how to be more charitable so that we can find more common ground and hence become more empathic. Like consequentialism the thing that needs to be changed is the world: we have to practice charity and find new ways to be charitable. Although the end goal of this practice is to become more empathic, this is not part of the ethical decision procedure- it is a consequence. Charity Ethics is also humanistic like Virtue Ethics. Instead of using an abstract standard, each person must find ways to engage charitably with other people (and other organisms, potentially). It is through this charitable engagement with others that ethical decisions can be made and evaluated. 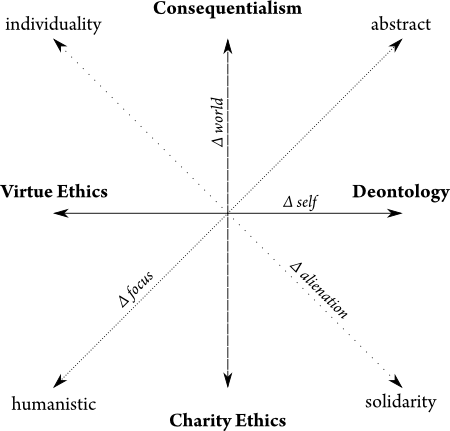 Lastly consider the remaining dimension, from the upper left to bottom right, which is a property that Virtue Ethics and Consequentialism agree on but oppose both Deontology and Charity Ethics. Perhaps there are other properties, but I lighted upon what I call ‘alienation.’ Alienation is how the ethics prioritizes individuals and groups. Both consequentialism and virtue ethics are very accepting of an individualistic perspective. Under consequentialism a person is to maximize of the ‘good,’ which takes no account of personal, family or other social relations. An agent decides the best possible abstract outcome and acts accordingly. Likewise, virtue ethics is focused upon living an excellent life, which may mean different things for different people. How to live excellently is a personal decision and, hence, may not include personal, family or social relations. Opposing this individualism is solidarity. A deontologist will likely take personal, family and social relations into account as part of their obligations. A parent will have an obligation to their child over the well-being of other children. Similarly Charity Ethics requires other individuals, else there would be no one to be charitable with. Moreover, since a person will have greater opportunity to help a child or friend, or close social group, these personal relations can be prioritized. This opposition cross is based upon the ethical decision making under different theories. 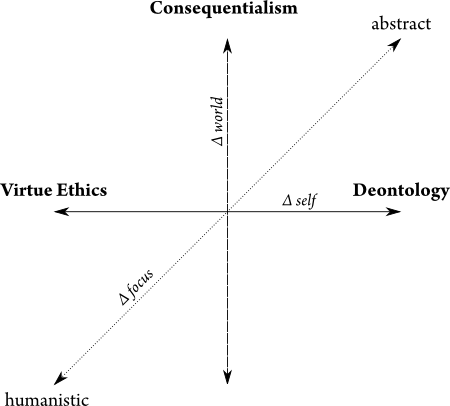 The similarity between Virtue Ethics and Deontology, with regard to how both seek to change the self, while Consequentialism is based on changing the world, is something I had never before considered. It might be a trivial issue, but, since it came directly from the question about making ethical decisions, it seems more significant. 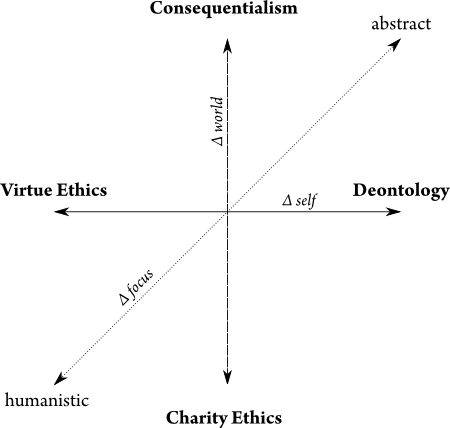 Also, Charity Ethics being a humanistic ethical theory that focuses on changing the world is nice both in the sense that it is new and different, and also that it fills out the chart in direct opposition to Consequentialism. The value of the chart will ultimately depend on the significance of initial question, but, even if we disregard it, this diagrammatic approach still provides some interesting ways to analyze the ethical theories. Posted in ethics, philosophy. Tagged with ethics.